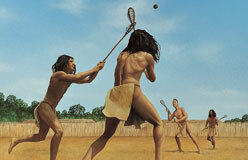 The very first Americans were big-game hunters who carried spears of bone and stone. They came from Asia, but they weren’t looking for a new place to live. 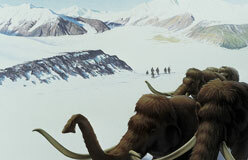 They were following the giant buffalo and woolly mammoths. They tracked and killed those animals to survive. In North America, they found beavers as big as bears, but no jets roared through the skies, and no car horns honked. There were no towns, cities, highways, or shopping malls. The forests were dense and untouched. A squirrel could go thousands of miles across the continent jumping from tree to tree without ever touching the ground. 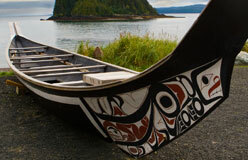 Over thousands of years, the first Americans developed many ways to live on the land. Some settled along the coasts. 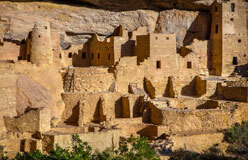 Others came to live in forests, on the plains, or in cliff houses high above deserts. 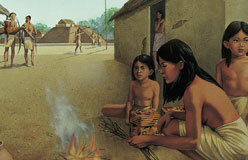 Wherever they made their homes, they used the land’s natural resources wisely. By 1492, most first Americans hunted and farmed for a living. In the Arctic, they hunted whales, seals, and caribou. 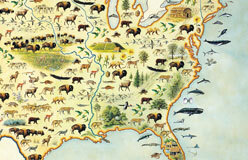 In other places, they fished, gathered wild plants, and hunted animals such as buffalo and deer. They killed animals not for sport, but for food, shelter, and clothing. Christopher Columbus arrived in the Americas in 1492. 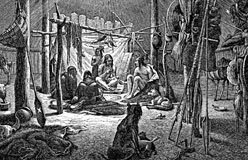 Let’s take a look at what life was like in North America just a short time before Columbus got here. We’ll have to step back in time more than 500 years to meet the first Americans. If you’re ready to time-travel, let’s go!